Probably because 25 to 50 unit sales is not enough to make it worthwhile, I have somebody who could sculpt all these figures brilliantly but the numbers you would need to sell just don't add up. I dont know abut that...Tamiya, Dragon and the like have sets of figures coming out all the time. If they didnt sell Im sure those woudnt be produced. Whats the difference between a four figure set of Russian infantrymen or tank crewmen and a four set of figures of US Navy deck crewmen or USAF crewmen? Those figures, the first three, look like the officers or CPO's rather than the guys who do the real grunt work on the flight deck. 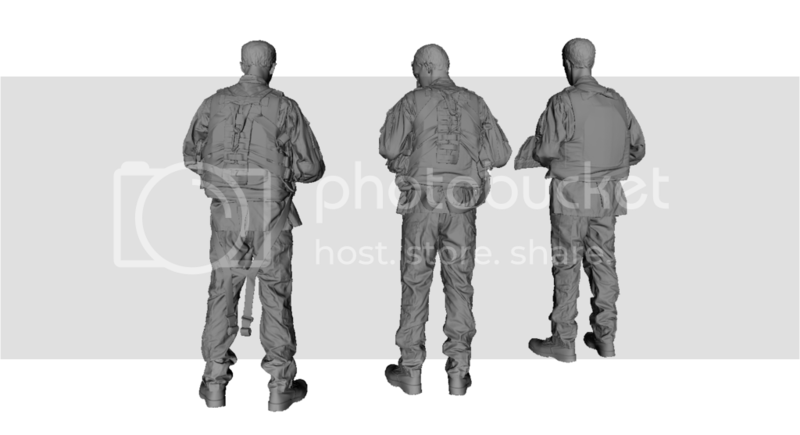 If I'm understanding it right it looks like the figures are scans of real people dressed in uniforms etc and possibly made on a 3D machine so they aren't made until ordered which would allow them to be made in the scale required. I could be wrong but that's how I see it. I would like to see the quality of them as far as details and so on. Also a price guide would be nice too as none are given on Facebook that I can see but I'm not a member of Facebook either. Hi Norbert, thankyou for the information. The detail of the CG rendering looks amazing. If the models can be produced showing that kind of fidelity they will raise the bar for scale figures. I agree with some of the comments that more modern figures are needed. There are very few good quality scale ground crewmen/women in 1/32nd scale. I hope that these become a reality and that the range expands to include more forces. Frankly I think it's difficult to get good value for money with 3D print on demand today, I mean surface qualities at least EnvisionTEC Perfactory, resin casting remains unbeatable for some time. Maybe I'm wrong but my experience on 3d printing says this. That means you were disapointed by todays offer in 3D printing : expensive but not getting expected quality, and expected quality at sky high unafordable cost. Let's wait the machine coming in in 3 weeks from Swizerland, so we can quit virtual discusion. Reedoak will also offer 3D printing service. finger crossed, the investment was high, but factory tests show very sharp results. How about some 1/32 modern british ground crew all the modern ground crew stuff is USAF. and how about some British ground equipment too.it's pretty difficult to do a RAF diorama. had the same question with the dutch army. The succes of that kind is first to find good references, and for me to numerize originals. That means a trip in UK, which will be possible if there is enough interest. Yepee! Pilots for my Boomerang and Kittyhawk kits...! 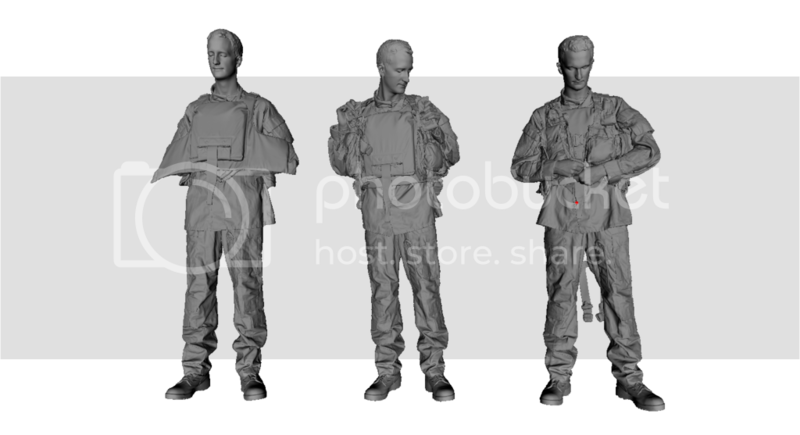 added a choice between 3 poses of US army pilots with body armour, putting their flight gear on. Really like that one on the far right in the first pic, and far left on the 2nd. The loos straps and pose of the figure adds a lot of movement to the figure. Many thanks Brian. You're probably right, I shall work the movement a little more, but with no excess. And maybe change the rendering software, all this looks a little flat. Machine comming normaly end of next week in, hope to get next test shots soon.